Grassroots Giving (www.grassrootsgiving.info) is a Florida not for profit organization benefiting underprivileged and foster children of Volusia & Flagler counties. Founded in 2006 by a local counselor working with foster families, the organization provides funding for those things many of us take for granted such as registration fees for sports, summer camps, tutoring, and music lessons. "Sixteen Candles & More" will be held on Saturday My 15th in Ormond Beach to benefit Grassroots Giving. The is an 80's themed event featuring live music performed by Finding Ivy, food catered by Lulu's Oceanside Grill, the infamous TikiTender (hey that's me!) behind the bar, and the awe-inspiring talents of Meraux Dantes. I hope you will consider joining me in supporting this fundraiser. Tickets may be purchased in advance for $30 in advance or $35 at the door. Visit the Grassroots Giving website below and click on "Donations/Tickets". You can also RSVP and keep up with the latest news about this event on Facebook at http://www.facebook.com/event.php?eid=317371272231&index=1. Now the big question is: Do I dress in Miami Vice, Breakfast Club, or Fast Times at Ridgemont High style for the party? I am donating my talents to this event, please do me the favor of sharing it with your friends. Mahalo nui loa! First of all, yes I still use myspace. I enjoy the relatively private format of it. No one has to know my real name, connections to family, whether I liked the cleavage of that redhead in Oregon. Plus, everyone knows I keep my fingers busy in many outlets. I like to keep it positive, but I have a little rant. The the few bands that keep filling my inbox with event reminders & notices of their new forthcoming CD I am happy for you and proud of your accomplishments. I have meant many of you in person and been to your shows. I am proud of you for discovering how to use the internet in order to promote your ventures. We all know that I was born through a marriage of charm and web 2.0. That being said, filling my "inbox" with 55 reminders of your show that is coming up in 6 months, 3 months, 2 months, 6 days, 5 days, 3 hours is not appreciated. In fact, it is quite old fashioned and annoying. The beauty of web 2.0 is its information "stream", be it twitter, facebook, or even myspace. Post a bulletin, post a status, create an event, send a tweet. Let your fans and me see the information when we want to. Post it 8 times a day, I've done it. But please save my "inboxes" for personal messages, relative to me only. a. Facebook status update, tweet, or myspace bulletin "The Tiki Pimps playing live with the Dawn Ho's at the Coconut Lounge next week. Click this link for more info. Hope to see you there." b. Facebook inbox, twitter DM, or good old fashioned email "Hey TikiTender, if you want to come to our show at the Coconut Lounge let me know. We will leave passes at the door. If you can't come we will send you a t-shirt, CD, and a large breasted redhead because we appreciate you being a fan so much." It really is the whole point social media to put out the information and let people scoop it up not to grab them by the throat and say "Read This!!!! Don't you see the little light on your blackberry, fool!!! Read this!!!! I don't think you saw it the first time so here it is on your email too!!!! I know you don't know how to use a calendar application on your phone or computer so I will remind you myself over and over and over and over and over and over and over and over. Since I just learned how to type, I will also misspell the subject line on EVERY email!!!!" So, from this point forward, I will be deleting the bands who choose to constantly send me poorly worded & redundant messages. Unless of course its a band I actually care about, like The Transfers or Say Never. You guys rock. I know this might sound funny coming from the king of twitter and facebook status updates. But pretend for a second that every time I went to Poor Walt's I sent all of you personal messages that probably give you a least an email alert saying "Checked in at Walt's". You wouldn't be my friend for long would you? Well you probably would because I'm awesome. While I am on the subject of poor etiquette. Hey products, brands, and businesses. Look into "fan pages" on facebook. No thanks to such and such brand name, I will not be accepting you as a friend. As public as I seem I don't like giving out all the details of my life to a company or brand. I will happily become a fan of your product thought if it interests me. That's why fan pages work. I can get all your information (good for you) while still keeping my information private (good for me). Okay, back to putting smiles on people faces. Every few Mondays I am a guest on Island Time Radio Show. The last time I called in Ray Fogg was an in-studio guest. After I did my little update from A1A and The Golden Lion, he wrote and recorded an intro to be used when I am a guest. Thanks Ray!! Here's the all new TikiTender Intro!!! It can also be found on my media page at www.tikitender.com/media.html. Based in Berea, OH and streaming online around the world, Island Time Radio is hosted by fellow phlocker Dennis King. Tune in to hear the best of trop rock, in studio guests, and tropical drink recipes from me! 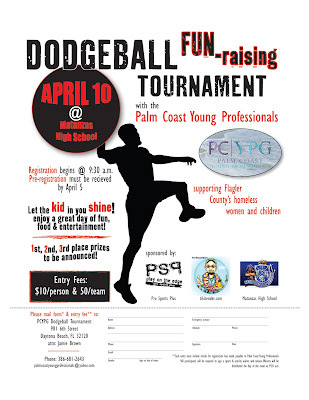 TikiTender Is Proud To Sponser The PCYPG Dodgeball Tournament! I had an amusing beginning to my shift today. Dontcha wanna know all about it? I worked day shift (that by itself is a little amusing) and was talking to a regular when a couple, clearly tourists, strolled in to the restaurant and sat at the bar. An older couple from Atlanta, they were snapping photos and enjoying the view. The gentleman asked me if the kitchen was up and running. I answered "Sure" and handed them menus with a smile. I went about my routine for a couple of minutes while they looked at the menu. They were my second customers of the morning so I was still getting fruit together, setting out napkins, etc. They made their and I place an order for them. It was about 11:09. About three minutes later the cook came out and said she was starting the order, she had been getting some stuff out of the cooler. The old dude said "You mean she hasn't started it yet?" I replied that the order was started. After about 10 minutes he said "Partner, if I had known my food was gonna take this long I would never have ordered it." Amused & irritated at the same time I replied with a smile "So sorry I didn't know you were in a rush. If you can bear the ocean view for just a couple more minutes, I am sure your order will be ready right away." A few more minutes passed and I presented their order. They ate, chatted, paid, tipped (well), and proceeded to spend the next 30 minutes taking pictures of the ocean and beach from in and around the restaurant. After they left, one of the regulars and I both said almost the exact same thing to each other. Basically it was "How can you be impatient while sitting here staring at the ocean?" 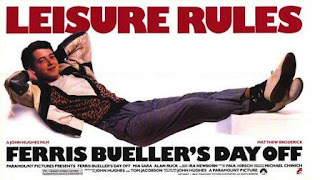 Gave us a good chuckle and made me think of the great quote from "Ferris Bueller's Day Off". All I'm saying is enjoy what life offers you, rather than being in a hurry to get to your next stop. I hope to squeeze some St. Patrick's Day revelry in between closing the bar on Wednesday and opening it on Thursday. The scheduling Gods were not kind to me this week, but my job rocks so I can't complain! Line from Star Wars that sound dirty, but really aren't. Thinking of DragonCon got me thinking about Star Wars, which got me thinking about one of my favorite collections of movie quotes. I remember the first time I read this, in the dark days of the internet (circa 1994). For Carly and her DragonCon friends! Also, for any of my friends who are still dealing with cold weather and want to warm up! In a large pot, combine apple juice, apple cider, sugar and cinnamon sticks. Bring to a boil, then remove from heat and let cool completely. When juice mixture is cool, Stir in the grain alcohol. Store in your preferred jug(s). Relay For Life Update: Time To Kick It Up A Notch! Team TikiTender is falling behind on the Flagler Beach Relay For Life leaderboard! When I fall behind, research & advocacy falls behind. Please donate as you are led and pass this on to your friends. Mahalo nui loa! Click the button above to help me raise funds for cancer research! Pour rum & lime juice over ice in a Collins glass. Top with ginger-ale. Susie Baker King Taylor (1848-1912) was the first African American to teach openly in a school for former slaves in Georgia. As the author of "Reminiscences of My Life in Camp with the 33d United States Colored Troops, Late 1st S.C. Volunteers", she was the only African American woman to publish a memoir of her wartime experiences.